Please join the George Barrett Social Justice Program and the Office of Public Interest for the first installment of our Social Justice and the Legal Profession series for the 2018-2019 school year. This panel will feature three outstanding young VLS alums working the public interest sector. Karen Lindell '12 is an attorney at the Juvenile Law Center in Philadelphia, which she joined as a Skadden Fellow in 2014. Vidhi Joshi '15 was a Skadden Fellow focusing on re-entry issues at Legal Aid Society of Middle Tennessee and the Cumberlands. Darrius Woods '17 is an Equal Justice Works fellow working on predatory lending and housing issues at Atlanta Legal Aid. The panelists will discuss their current work and their paths from VLS into public interest work. Lunch will be provided. Vidhi Sanghavi Joshi currently serves as a law clerk to Chief Judge Juan R. Sánchez in the Eastern District of Pennsylvania. Prior to clerking, she was a Skadden Fellow/Staff Attorney at the Legal Aid Society of Middle Tennessee and the Cumberlands, where she created and established the firm's prisoner re-entry practice. 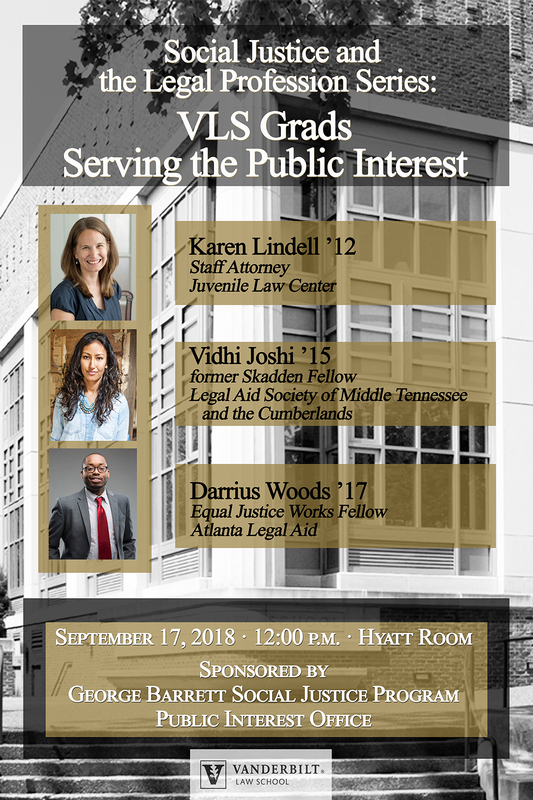 She is a 2015 graduate of Vanderbilt University Law School and a 2014 recipient of the Justice-Moore Family Scholarship, a scholarship awarded to students who have a demonstrated commitment to public service following graduation. Darrius Woods is currently an Equal Justice Works fellow at the Atlanta Legal Aid Society, Inc. His work focuses on providing legal advocacy to low-income communities and communities of color that are disproportionately impacted by predatory home purchase scams. The goal of his fellowship is to prevent abusive practices and build generational wealth. Darrius' two-year fellowship is funded by the Home Depot and Eversheds Sutherland, LLP. He graduated from Vanderbilt Law in 2017.